The second day of Movin’On is already behind us. Here’s a brief recap of what marked this sunny Wednesday in Montréal. Find your friends, identify your colleagues and relive your favorite moments by browsing through this photographic pot-pourri of this second day at Movin’On. Perhaps you’ve spotted this striking image as it made the rounds on social media over the past two days- a bright blue, futuristic “living” tire, the result of an inspiring fusion of technologies that offers a never-before-seen solution for sustainable mobility. Terry Gettys, Michelin Executive Committee Group member and Executive Vice President of Research and Development, presented the VISION tire concept: an airless tire composed of naturally sourced materials which is 100% biodegradable. “It is as beautiful as the nature which inspired it”, stated Mr Gettys at the press conference held earlier today in the Agora. Five hundred hours. 25,000 miles, and no fuel. Thanks to Solar Impulse 2, with Solvay as a main technological partner, participants got to take a look at a mock-up of the aircraft that completed a revolutionary, 17 months trip around the world. Jump into our most fascinating discussions live from the Aquarium at Movin’On by leave streaming our YouTube channel. Don’t be shy, speak up by using the #MovinOnConf hashtag! Inspired by the conferences you are attending at Movin’On? 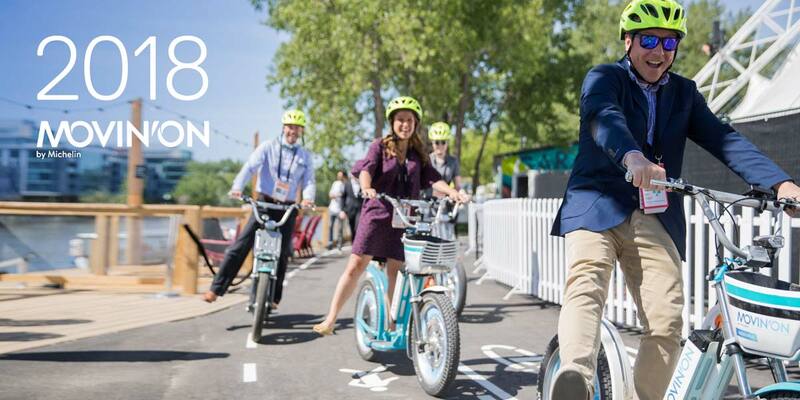 Excited to let your ideas flourish as the summer months progress and to contribute directly to sustainable mobility? The discussion is launched on Movin’On Contibues with Open Lab. Learn more. Our editorial team is everywhere onsite, capturing every moment that makes you smile, laugh, think or cry. But we don’t keep it to ourselves! This summer, we’ll publish The Movin’On Minutes to help you remember what you saw here. So put the pen down, there’s no need to take all those notes. Same time, same place tomorrow?